The Bluelab pH Pen is a handy option for hobby and small scale hydroponic growers. 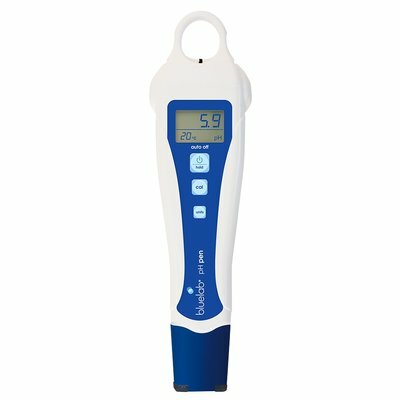 Maintaining proper pH levels is key in raising healthy, fruitful plants, and this pen accurately measures both the pH and temperature in your hydroponic system. It also features selectable units for ˚C and ˚F, a backlit LCD display, double junction probe, successful calibration indicator, hold function, low battery warning, auto off function, automatic temperature compensation, and is fully waterproof. This pH Pen has a range of 0.0 – 14.0 pH and 0-50 ˚C or 32-122 ˚F, and an accuracy to ±0.1 pH. It requires one AAA battery (not included), and has a 12 month manufacturer’s warranty.